For many reasons you might want to have a strawberry book or a cooking book instead of hunting for recipes on the internet. On this page you'll find the books with the best strawberry recipes and finest cookbooks along with some real gems of books. Some of the books are E-books, that you can download directly onto your computer and print them out. Others are hardcover or softcover books that you can buy either in your favorite local book store or online book store. Quick Easy Recipes Secrets provides you with step by step instructions to make your dishes successful. There is nothing more simpler than this. All you need to do is to follow exactly what has been written inside. This is the most extensive library of cookbooks I've found on the net. Although it hardly includes strawberry recipes, you'll find almost anything you'd like to cook. 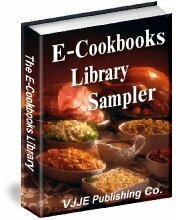 The E-cookbook library is downloadable as a Acrobat Reader file and it will be sent to you as a CD that you can read and browse on your computer. The Strawberry Recipes Collection contains over 100 different mouth-watering Strawberry Recipes that will not only taste good, and make you shine with your guests, but have excellent nutritional value as well! Click here for more information. Wonderful quirky and funny book about the American history of ice cream, chocolate and strawberries.This is not a cooking book. Just relax, sit down in your favorite chair and have a wonderful time reading this informative, yet amusing book about icecream, strawberry desserts, chocolate and much more. Click on the book cover to buy. 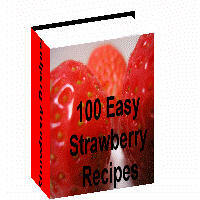 112 Pages full of delicious strawberry recipes. Enough to keep you busy cooking your favorite recipes for a long time. This little book has many new recipes you won't find anywhere else. Each of the strawberry recipes is delicious and so easy to make. This is highly recommended for all fruit and strawberry lovers! This book is part of a series Totally ...Cookbook. All of them are fantastic.